I am pleased to announce that I haven’t fallen off a treadmill in four days. That’s not for lack of trying. I should clarify and say that I am not, repeat NOT, actively trying to fall off a treadmill. It’s just that my legs have been awfully rubbery of late, so stepping off the treadmill can be an iffy proposition. The funny thing as that while my hip/posterior was where I thought I’d get a bruise, I actually did more damage to my arm. It’s a good thing, though… if my legs feel rubbery, that means it was a decent workout. Plus, the more I get my work in, the less time the legs stay rubbery. One thing I do know for sure is that the Balega socks are wonderful. They feel good when you put them on, there’s no seam to rub against your toes, and your feet are wonderfully dry when you’re done. I’m in the process of converting to a mostly moisture-wicking sock collection and selling the old cotton socks at the next edition of The Dreaded Yard Sale®. I figure I can get a quarter a pair… after all, most have hardly been worn, and it’s all for charity! I also am going to pick up a pair of Balegas for Supportive Partner Woman (She of the ouchy back!). While her feet are nowhere near as bad as mine, she would probably benefit from a nice, comfortable pair of socks. 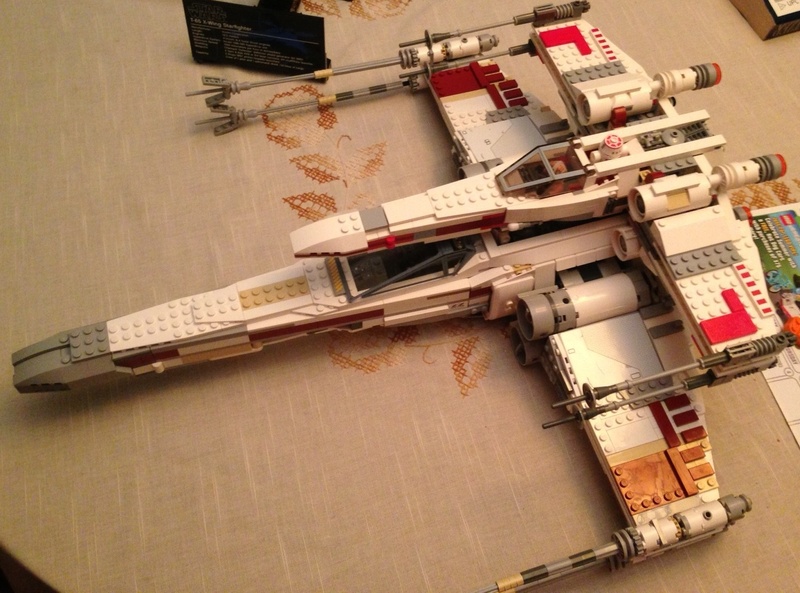 In other news, the Lego 10240 X-Wing is complete. It’s sizeable, especially when compared to the standard X-Wing that was released in 2012. The downside is that the new one is not scaled for minifigs… but I’m keeping Porkins, because, well, he’s Porkins. I’ll probably sell the other one… limited display space is a bad thing. This is why I never bought the Super Star Destroyer. At any rate, that’s about all I have for today. Tomorrow and Friday bring sessions with the boys and hopefully my arm will continue to feel better. Oh, and I plan on continuing my streak of not falling off of treadmills or other objects.